Background: Family Zingiberaceae consists of the large number of medicinal plants and is well-known for its use in ethnomedicine and play a major role in Indian System of Medicine, Ayurveda. Objective: The aim of this study is the documentation of Zingiberaceous plants used in Ayurveda, adding information to the systematics, vernacular names and chemistry with experimental data. Materials and Methods: The live plants were collected from wild and successfully conserved at Herbal Garden of Arya Vaidya Sala, Kottakkal. The experimental data of each species has been collected from the various sources. The photographs were taken and all relevant data documented. Results and Conclusion: A total of 13 species belonging to 7 genera of Zingiberaceae were documented. The work will be useful to students and researchers as it provides an easy access to Zingiberaceous plants used in Ayurveda. The plants are characterized by the presence of volatile oils and oleoresins of export value. In general, the rhizomes and fruits are aromatic, tonic and stimulant. Some are used as food as they contain starch in large quantities while others yield an astringent and diaphoretic juice. The live plants were collected and successfully conserved at Herbal Garden of Arya Vaidya Sala, Kottakkal and Calicut University Botanical Garden for further studies. Detailed literature survey has pointed out that there are numerous Zingiberaceous plants described for treatment of many diseases and herbal medicine and they play a major role in the preparation of many Ayurvedic drugs. Literature was collected from different sources such as Ayurvedic classical texts, Floras, books, journals, internet databases etc., to make a list of medicinal plants classified under Zingiberaceae. The study documented 13 ginger species mainly used in Ayurveda viz., Alpinia calcarata (Haw.) Roscoe, A. galanga (L.) Retz., Amomum subulatum Roxb., Curcuma angustifolia Roxb., C. amada Roxb., C. aromatica Salisb., C. zedoaria (Christm.) Roscoe, C. longa L., Elettaria cardamomum (L.) Maton, Hedychium spicatum Buch.-Ham. Ex J.E. Sm., Kaempferia galanga L., K. rotunda L. and Zingiber officinale Roscoe. Leafy stem up to 1.5 m high. Leaves sessile, lamina glabrous, linear-lanceolate. Ligule membraneous, bifid. Inflorescence terminal, 10-15 cm long, peduncle densely pubescent. Bracts minute, triangular, pubescent. Flowers shortly pedicellate, calyx tubular. Corolla tube almost equal to the calyx, lobes oblong. Labellum obovate, variegated with dark purple and yellow, glabrous. Stamen shorter than labellum, anther thecae parallel, pubescent. Epigynous glands two, free from each other. Ovary trilocular with many ovules. Fruit globose, orange-red, seeds many [Figure 1]a-c.
Aromatic perennial herb over 2 m high. Leaves large, oblong-lanceolate. Petiole short, pubescent. Ligule entire, hairy. Inflorescence terminal, 25-30 cm long, peduncle densely pubescent. Bracts membranous and deciduous. Flower pedicellate, calyx cylindrical, greenish-white. Labellum ungiculate in the lower half, white with a few oblique lilac lines on either side of the midrib. Anther thecae light green to yellow. Epigynous glands irregularly lobed with rounded apices. Ovary ellipsoid. Fruit globose, seeds few [Figure 1]d-f. The name Amomum is derived from the Greek word ammos meaning, a = not and momos = impurity; an allusion to its use as an antidote for poison. Amomum is the second largest genus after Alpinia within Zingiberaceae with about 150-180 species, widely distributed in Southeast Asia. In India, the genus is represented by 22 species, mostly restricted to North-Eastern India and Southern India. The seeds and essential oil from seeds of many species are extensively used. Medicinally the seeds are credited with stimulant, stomachic, alexipharmic and astringent properties. Leaves simple, alternate, lamina oblong-lanceolate, petiole grooved above. Ligule deeply emarginated. Spike 6-12 cm long. Flower yellow, bract broadly obovate, green to pink. Bracteole obovate or spathiform. Calyx cylindric, tubular. Corolla tube shorter than lobes, pink-yellow, dorsal lobe obovate-oblong, lateral lobe oblanceolate. Labellum oblong, dark yellow. Lateral staminodes base slightly bulbous, hairy. Anther thecae oblong, epigynous glands yellow, warted. Ovary barrel-shaped, ovules many. Stigma subglobose. Fruit a capsule, seeds black, arillate [Figure 1]g-i. The seeds of A. subulatum are a rich source of essential oil. The composition of the oil has been studied to obtain 1,8-cineole (74%) and limonene (10.3%) as major components along with several minor mono-and sesquiterpenoids. The extract of the seeds has also been reported to afford a few glycosides, viz., subulin, petunidin-3,5-diglucoside, leucocyanadin- 3-O-D-glucopyranoside along with cardamom and alpinetin. , Its seed oil was found to be highly active against the growth of keratinophhilic fungi. The seeds contain a chalcone-cardamonin and a flavone-alpinetin. The glycosides-petunidin-3,5-diglucoside, leucocyanidin- 3-O-D-glucopyranoside and subulin. Seeds on steam distillation yield an essential oil containing cineole as the principal constituent. Other constituents include pinene, sabinene, p-cymene, terpinen-4-ol, terpineol, nerolidol, terpinene, terpinyl acetate and bisabolene. , A new aurone glycoside-subulin was isolated from seeds. Half-sib progeny analysis for variability, association among capsule traits and path coefficient analysis among components of essential oil in large cardamom were done by Karibasappa et al. The seed mass weight, shell weight, mature seed index, total soluble solids of seed mucilage, seeds/capsules and total anthocyanins had high positive direct effect on oleoresin content and negative direct effect towards cineole component. Rhizome light yellow inside, white towards the periphery with the smell of green mango. Root tubers absent. Lamina oblong, lanceolate. Inflorescence lateral or central. Coma bracts violet and fertile bracts green. Flowers longer than bracts. Calyx truncate. Corolla tube funnel shaped, pale yellow, lobes unequal, white. Labellum somewhat elliptic, 3 lobed, midlobe emarginte. Stamen white, epigynous glands linear. Ovary trigonous, ovules many. Seed setting not common [Figure 1]j-l.
Leaves elliptic, sheath keeled, glabrous, ligule membranous, acute, glabrous. Spike terminal, bracts obovate, obtuse and thinly pubescent. Flowers yellowish-white; calyx lobes truncate, glabrous. Corolla unequal, larger lobes oblong, obtuse to shortly bifid at apex, lip obovate, deeply divided above, yellow. Staminodes obovate, entire, anthers spur divaricating, connective shortly producing; ovary pubescent [Figure 1]m and n.
Rhizome greyish yellow within. Leaves distichous, lamina broadly lanceolate. Inflorescence lateral, peduncle covered by sheaths. Coma bracts pink and fertile bracts greenish-white. Corolla tube funnel-shaped, lobes unequal, pinkish-white, dorsal lobe broadly ovate and lateral lobes oblong. Labellum orbicular, deep yellow. Lateral staminodes oblong, style filiform [Figure 1]o-q. Rhizome conical, orange-yellow inside, strongly aromatic. Lamina oblong-lanceolate. Ligule short, near the lamina. Inflorescence central, spike with coma and fertile bracts. Flowers equal to the bracts. Bracteoles ovate-oblong. Corolla lobes unequal, dorsal lobe larger and lateral lobes linear and small. Labellum trilobed, middle lobe emarginated. Anther thecae spurred. Style filiform, stigma bilipped. Fruiting not common [Figure 2]a-c.
Rhizome greyish to yellow inside, whitish toward the periphery. Lamina oblong-lanceolate. Inflorescence lateral, spike 10-15 cm with a distinct coma. Coma bracts deep pink, fertile bracts broadly ovate, green with pink tip. Bracteoles, outer larger, innermost white to light pink. Flowers as long as or slightly smaller than the bracts, Corolla tube funnel-shaped, lobes unequal. Labellum broad, light yellow with a median dark yellow band. Stamen spurred at base. Stigma slightly exserted from the anther. The rhizome of C. zedoaria is used as appetizer and tonic, particularly prescribed to ladies after childbirth. In case of cold, a decoction of long pepper (Piper longum), cinnamon (Cinnamomum verum), zedoary and honey is given. In Ayurveda, it is an ingredient of "Braticityādi kwatha", used in high fever. The identity of the plant sources of the drug C. zedoaria (Karcura) is a matter of debate. There is difference of opinion among men of Ayurveda, as to whether Sati and Karcura are the same drug or different. Many authors consider them different and equate Sati with Hedychium spicatum Smith. and Karcura with C. zedoaria, both belonging to Zingiberaceae. It was reported by Sharma  that, the essential oil of its dried rhizome yielded 36 compounds, including 17 terpenes, 13 alcohols and 6 ketones. Among the constituents, epicurzerenone and curzerene were found in the first and second highest amounts in this species. The generic epithet Elettaria is derived from Rheed's Elettari. Elathari (Modern transcription of Rheed's name) is still used for the seeds of E. cardamomum (thari means granules). The genus consists of about 8 species. Only one species, E. cardamomum occurs in India and this is the only economically important species. The genus is distributed from Sri Lanka to Malaysia and Indonesia. Rhizome branched, thick. Leaves bifarious, elliptic-lanceolate. Flowers in prostrate or erect, bracts scarius, calyx tubular, corolla white, tube equal to the calyx, lobes unequal, oblong; Labellum obovate, white with red lines; stamen, filaments short; anther cells parallel, shortly spurred, staminodes short, ovary 3-celled, ovules many, style filiform, stigma funnel shaped. Capsule ellipsoid, striate, seeds many, angular, fragrant [Figure 2]d-f. The name Hedychium comes from the Greek words, Hedys (sweet) and chion (snow), referring to the fragrant white flowers. The genus has about 80 species, mostly distributed in Indo-Malayan region. Among this, only one species Hedychium spicatum is used as a raw drug for different ayurvedic preparations. Hedychium spicatum Buch.-Ham. ex J.E. Sm. Leafy shoots up to 1 m high. Leaves distichous, lamina oblong-lanceolate. Inflorescence terminal, spike lax or dense flowered. Bracts oblong or convolute round the calyx. Bracteoles smaller than the bracts. Flowers longer than the bracts. Calyx tubular, longer than or shorter than the bracts. Corolla tube long, slender, lobes equal. Labellum deeply lobed, lateral staminodes linear. Stamen shorter than the labellum, filament red or pale yellow. Anther straight or curved. Ovary trilocular. Fruit globose [Figure 2]g.
The rhizome in powder form is sprinkled as an antiseptic agent and also used as a poultice for various aches and pains. It is a carminative and bronchodialator. The drug is an ingredient of some Ayurvedic preparations but rarely used in Unani system. Because of its camphotraceous odor, this drug is often considered as a substitute of Curcuma zedoaria. Rhizome strongly aromatic, lamina broadly ovate to orbicular. Inflorescence sessile, imbricating leaf sheaths, bracts bifarious, outer larger, inner smaller ovate-acuminate, bracteoles split to the base, transparent. Calyx equal to or shorter than the bracts. Corolla lobes white, linear. Labellum slightly broader than long, lateral staminodes, obovate, white. Anthers white, sessile. Stigma globular with a lateral slit. Epigynous glands erect, embracing the lower part of the style [Figure 2]h-j. The leaves are used for pharyngodynia, ophthalmia, swellings, fever and rheumatism. Kaempferia Galanga, also called regionally as Karcura (Kacholam) is a reputed remedy for all diseases caused by the morbidity of vāta and kapha and is especially useful in respiratory ailments such as cough, bronchitis and asthma. The drug is reported to be acrid, hot, bitter and aromatic. It cures skin diseases, wounds and splenic disorders. The rhizome is a constituent of a variety of Ayurvedic preparations like Daϊamϋlāris.t.am, Valiya rāsnādi kas.āyam, Kaccorādi cϋrn.a, Aϊanā elādi tailam, Valiya Nārāyan.a tailam, etc. The identity of the plant sources of the drug Karcura is a matter of debate. The source of Karcura in Kerala in the recent times has been Kaempferia galanga. It was reported by Wong et al., that the composition of the essential oil of rhizomes of K. galanga L. contained 54 components, of which the major constituents were ethyl trans-p-methoxycinnamate (51.6%), ethyl cinnamate (16.5%), pentadecane (9.0%), 1,8-cineole (5.7%), γ-car-3-ene (3.3%) and borneol (2.7%). Terpenoid constituents amounted to 16.4%. Leafy shoot 50-65 cm high. Leaves few, erect, lamina oblong-lanceolate, purple beneath, mottled green above, ligule small, hairy. Inflorescence appearing before the leaves, enclosed within greenish-purple. Calyx unilaterally split, tip with two dorsal ridges, light violetish, transparent. Corolla tube slightly longer than the calyx, lobes white, very narrow, lanceolate with acuminate tip. Labellum broadly ovate, lateral staminodes ovate elliptic. Filament short, erect, sparsely pubescent. Stigma slightly flattened and cupular, margin hairy. Fruiting not common [Figure 2]k-m. The generic epithet Zingiber was derived from Tamil "ingiver" meaning ginger rhizome. This term is spread to ancient Greece and Rome through the Arab traders and from them to Western Europe. Some authors believed that the name was derived from the Sanskrit word "Sr.ngavera", which means "horn-root," rhizome. The genus is represented by 141 species,  distributed mainly in tropical Asia. In India the genus is represented by 12 species and among this Z. officinale has a greater role in the preparations of various ayurvedic drugs. Rhizome palmately lobed, greyish-yellow within, pungent. Lamina narrowly lanceolate. Inflorescence radical, leafless peduncle. Bracts green with a paler membranous margin, bracteoles ovate-oblong. Flowers longer than the bracts, fragile. Corolla tube included within the bracts, lobes almost equal. Labellum more or less round, dark purple, blotched creamy-yellow. Stigma white, prolonged above the crest. Ovary glabrous [Figure 2]n-p. In the present study, 13 Zingiberaceous herbs used as raw drug for various ayurvedic formulations have been documented. In the genus Alpinia, A. galanga is the most important one, which finds varying uses in ayurvedic preparations such as "Rāsnādi powder". In Curcuma, C. longa is the most popular one, which has been studied in greater depths already. C. aromatica is used in the treatment of skin diseases and is extensively used in vanishing creams. Kaempferia galanga has become very popular and is identified to have tremendous effect in curing bronchial and gastric diseases. Of late, it is being used in preparations of mouth washes and oral deodorants. K. rotunda is another related crop under this genus, which has potential for great exploitation on a commercial basis. Zingiber officinale has also plays a major role in the preparation of various Ayurvedic formulations. The authors are thankful to the authorities of Arya Vaidya Sala, Kottakkal. They are also thankful to Dr. V. P. Thomas, Assistant Professor, St. Thomas College, Thrissur, Kerala, India for his support. 1. Jantan IB, Yassin MS, Chin CB, Chen LL, Sim NL. Antifungal activity of the essential oils of nine Zingiberaceae species. Pharm Biol 2003;41:392-7. 2. Kress WJ, Prince LM, Williams KJ. The phylogeny and a new classification of the gingers (Zingiberaceae): Evidence from molecular data. Am J Bot 2002;89:1682-96. 3. Sabu M. Zingiberaceae and Costaceae of South India. Kerala: Indian Association for Angiosperm Taxonomy, University of Calicut; 2006. 4. Tomlinson PB. Studies in the systematics anatomy of the Zingiberaceae. J Linn Soc (Bot) 1956;55:547-92. 5. Prabhu KM, Thomas VP, Sabu M. Economically important gingers. In: Proceedings 22nd Kerala Sci Cong KFRI. 2010. p. 816-7. 6. Warrier PK, Nambiar VP, Ramankutty C. Indian Medicinal Plants. Madras: Orient Longman Ltd.; 1993-1995. p. 1-5. 7. Thakur RS, Puri HS, Husain A. Major Medicinal Plants of India. Lucknow, India: CIMAP; 1989. p. 50-2. 8. Joy PP, Thomas J, Mathew S, Skaria BP. Zingiberaceous Medicinal and Aromatic Plants. Odakkali, Asamannoor P.O., Kerala, India: Aromatic and Medicinal Plants Research Station; 1998. 9. Sivarajan, VV, Indira B. Ayurvedic Drugs and their Plant Sources. New Delhi: Oxford and IBH Publishing Co. Pvt. Ltd.; 1994. p. 570. 10. Chunekar KC. Bhavaprakashanighantu of Sri Bhavamishra. Commentary. Varanasi: Chaukhamba Bharati Academy; 1982. 11. Asolkar LV, Kakkar KK, Chakre OJ. Second Supplement to Glossary of Indian Medicinal Plants with Active Principles Part I (A-K). New Delhi: Publications and Informations Directorate (CSIR); 1992. p. 414. 12. Perveen R, Islam F, Khanum J, Yeasmin T. Preventive effect of ethanol extract of Alpinia calcarata Rosc on Ehrlich's ascitic carcinoma cell induced malignant ascites in mice. Asian Pac J Trop Med 2012;5:121-5. 13. Arambewela LS, Arawwawala LD, Ratnasooriya WD. Antinociceptive activities of aqueous and ethanolic extracts of Alpinia calcarata rhizomes in rats. J Ethnopharmacol 2004;95:311-6. 14. Kong LY, Qin MJ, Niwa M. Diterpenoids from the rhizomes of Alpinia calcarata. J Nat Prod 2000;63:939-42. 15. Rath SP, Sahoo SB, Sreenivasulu C. Analysis of cultivated Alpinia calcarata. J Nat Prod 1994;10:12-3. 16. Qureshi S, Shah AH, Ageel AM. Toxicity studies on Alpinia galanga and Curcuma longa. Planta Med 1992;58:124-7. 17. Chopra IC, Khajuria BN, Chopra CL. Antibacterial properties of volatile principles from Alpinia galanga and Acorus calamus. Antibiot Chemother (Northfield Ill) 1957;7:378-83. 18. Inamdar MC, Khorana ML, Rao MR. Expectorant activity of Alpinia galanga Willd. Indian J Physiol Pharmacol 1962;6:150-3. 19. Zheng GQ, Kenney PM, Lam LK. Potential anti-carcinogenic natural products from lemongrass oil and galanga root oil. J Agric Food Chem 1993;41:153-6. 20. Quereshi S, Shah AH, Ahmed MM, Rafatullah S, Bibi F, Al-Bekari AM. Effect of Alpinia galanga treatment on cytologicsal and bio-chemical changes induced by cyclophosphamide in mice. Int J Pharmacognosy 1994;32:171-7. 21. Husain A, Virmani OP, Popli SP, Misra LN, Gupta MM, Srivastava GN, et al. Dictionary of Indian Medicinal Plants. Lucknow, India: CIMAP; 1992. p. 546. 22. Sastry MS. Comparitive chemical study of two varieties of galangal. Indian J Pharm 1961;23:76. 23. Itokawa H, Morita H, Sumitomo T, Totsuka N, Takeya K. Antitumour principles from Alpinia galanga. Planta Med 1987;53:32-3. 24. Rastogi RP, Mehrotra BN. Compendium of Indian Medicinal Plants. Vol. II. New Delhi: Central Drug Research Institute, Lucknow and Publications and Information Directorate; 1991. p. 833. 25. Xia YM, Kress WJ, Prince LM. Phylogenetic analysis of Amomum (Alpinioideae: Zingiberaceae) using ITS and matK DNA sequence data. Syst Bot 2004;29:334-44. 26. Thomas VP, Sabu M, Kumar KM. Amomum nilgiricum (Zingiberaceae), a new species from Western Ghats, India. PhytoKeys 2012;8:99-104. 27. Tushar, Basak S, Sarma GC, Rangan L. Ethnomedical uses of Zingiberaceous plants of Northeast India. J Ethnopharmacol 2010;132:286-96. 28. Mishra AK, Dubey NK. Fungitoxicity of essential oil of Amomum subulatum against Aspergillus flavus. Econ Bot 1990;44:530-3. 29. Husain A, Virmani OP, Sharma A, Kumar A, Misra LN. Major Essential Oil-Bearing Plants of India. Lucknow: CIMAP; 1988. p. 34. 30. Lawrence BM. Terpenes in two Amomum species. Phytochemistry 1970;9:665. 31. Lakshmi V, Chauhan JS. Structure of a new aurone glycoside from Amomum subulatum seeds. J Indian Chem Soc 1977;15B: 814. 32. Bheemasankara Rao C, Namosiva Rao T, Suryaprakasam S. Cardamonin and alpinetin from the seeds of Amomum subulatum. Planta Med 1976;29:391-2. 33. Jain PC, Agrawal SC. Notes on the activity of some odoriferous organic compounds against some keratinophilic fungi. Nippon Kingakkai Kaiho Chem Abstr 1979;90:198-238. 34. Lakshmi V, Chauhan JS. Chemical examination of the seeds of Amomum subulatum. J Indian Chem Soc 1976;53:633. 35. Karibasappa GS, Dhiman KR, Rai RN. Half-sib progeny analysis for variability, association among capsule traits and path coefficient analysis among componenets of essential oil in large cardamom (Amomum subulatum). Indian J Agric Sci 1989;59:621-5. 36. 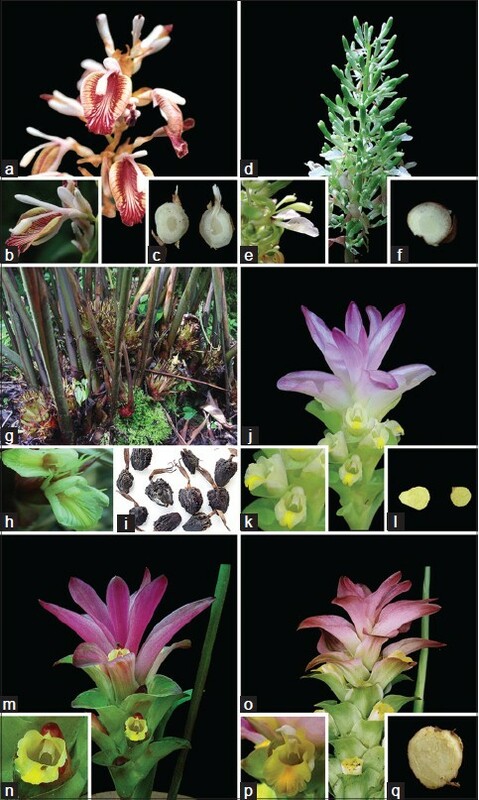 Sckornickova J, Sabu M, Prasanth Kumar MG. Curcuma mutabilis (Zingiberaceae): A new species from South India. Gard Bull Singapore 2004;56:43-54. 37. Farrel KT. Spices Condiments and Seasonings. 2nd ed. New York: AVI; 1990. p. 203-6. 38. Velayudhan KC, Muralidharan VK, Amalraj VA, Rana RS, Singh B, Thomas TA. Genetic Resources of Curcuma. Thrissur: NBPGR; 1994. p. 74. 39. Kirtikar KR, Basu BD. Indian Medicinal Plants. Vol. II. Dehra Dun: Internat Book Distributors; 1988. 40. Prabhu Kumar KM, Thomas VP, Sabu M, Rajendran A. Some important medicinal herbs in the family Zingiberaceae in India. Herb Med 2010. p. 65. 41. Saji KV, Sasikumar B. Mango ginger-endowed with mango, ginger and turmeric qualities. Spice India 2004;17:23-4. 42. Moon K, Khadabadi SS, Deokate UA, Deore SL. Caesalpinia bonducella F - An overview. Rep Opin 2010;2:83-90. 43. Gupta M, Shaw BP, Mukherjee A. A new glycosidic flavonoid from Jwarhar mahakashay (antipyretic) Ayurvedic preparation. Int J Ayurveda Res 2010;1:106-11. 44. Singh G, Singh OP, Maurya S. Chemical and biocidal investigations on essential oils of some Indian Curcuma species. Prog Cryst Growth Charact Mater 2002;45:75-81. 45. Banerjee A, Nigam SS. Antifungal activity of the essential oil of Curcuma angustifolia. Indian J Pharmacol 1977;39:143-5. 46. Srivastava AK, Srivastava SK, Syamsundar KV. Volatile composition of Curcuma angustifolia Roxb. rhizome from central and southern India. Flavour Fragr J 2006;21:423-6. 47. Kolammal M. Pharmacognosy of Ayurvedic Drugs. Trivandrum: Ayurveda College, Trivandrum; 1979. 48. Kurup PN, Ramdas VN, Joshi P. Handbook of Medicinal Plants. Oxford and IBH publishing Co pvt ltd; New Delhi: 1979. 49. Nadkarni AK. Indian Materia Medica. Vol. 408. Bombay: Popular Prakashay; 1954. p. 1476. 50. Chempakam B, Parthasarathy VA. In: Parthasarathy VA Chempakam B, Zachariah TJ, editors. Chemistry of Spices; Turmeric. King's Lynn, Oxfordshire, UK: Biddles Ltd.; 2008. 51. Sharma PV. Dravyaguna Vijnana. Varanasi: Chaukhamba Bharati Academy; 1983. p. 605. [In Hindi]. 52. Islam SN, Monira A, Ferdous AJ, Faroque AB, Ahsan M. In vitro antibacterial activities of commonly used spices. Bangladesh J Bot 1990;19:99-101. 53. Mahmud S. Composition of essential oils of Elettaria cardamomum Maton leaves. Pak J Sci 2008;60:111-4. 54. Qian DS, Liu ZS. Pharmacologic studies of antimotion sickness actions of ginger. Zhongguo Zhong Xi Yi Jie He Za Zhi 1992;12:95-8, 70. 55. Kam YK. Taxonomic studies in the genus Kaempferia (Zingiberaceae). Notes R Bot Gard Edinburgh 1980;38:1-12. 56. Sabu M, Prabhu Kumar KM, Thomas VP, Mohanan KV. Variability studies in 'Peacock Ginger', Kaempferia elegans Wall. Ann Plant Sci 2013;2:138-40. 57. Wong KC, Ong KS, Lim CL. Compositon of the essential oil of rhizomes of Kaempferia galanga L. Flavour Fragr J 1994;7:263-6. 58. Theilade I. 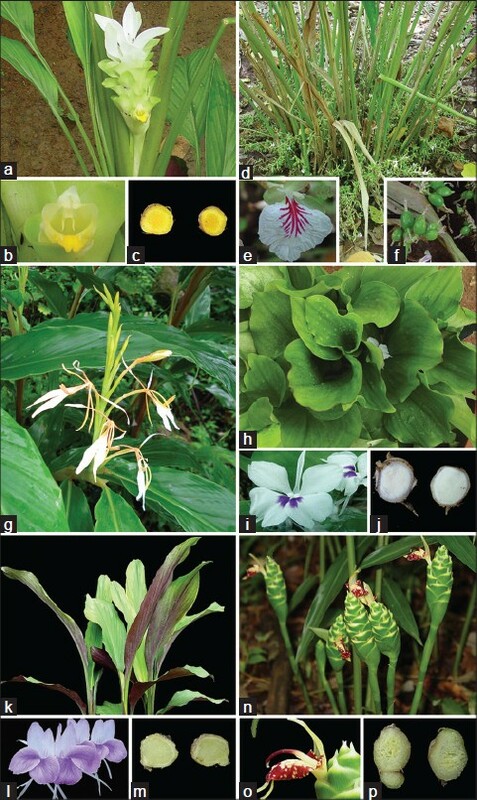 Revision of the genus Zingiber in peninsular Malaysia. Gard Bull Singapore 1999;481:208-36. 59. Singh G, Kapoor IP, Singh P, de Heluani CS, de Lampasona MP, Cesar AN. Chemistry, antioxidant and antimicrobial investigations on essential oil and oleoresins of Zingiber officinale. Food Chem Toxicol 2008;46:3295-302.